The Savela Law Firm is committed to providing the best service and representation to individuals and small businesses. I do not represent the government, large corporations or insurance companies. I help people. I have never been a prosecutor. My expertise comes from over 17 years of trying cases to juries for individuals. If you are facing criminal charges, or are worried you might be, call me. I can help. If you hire The Savela Law Firm, you get me. I will be there at all hearings and meetings. I will work your case from start to finish. You will not be handed off to another attorney that you did not hire. When we appear in court, you will be my only case. You will get personal, professional service. I will prepare you for what happens next and explain what just happened. Together, we will get the best result possible, whether it be a negotiated plea bargain or taking our case to a jury at trial. Since the beginning of my career as a Colorado Public Defender in Colorado Springs and Adams County, I have represented good people accused of crimes. I work with my client and investigate the evidence to provide the best Criminal Defense a Lawyer can provide. Over the years, I have successfully defended at trial charges of 1st Degree Murder, Sexual Assault on a Child, Aggravated Robbery, DUI, Domestic Violence, Drug Manufacturer and Drug Possession, Violation of Child Custody, Criminal Trespass, Careless Driving, and numerous other charges. Contact a Colorado criminal defense lawyer representing clients in Boulder, CO today to schedule your initial consultation. I have the experience and skill necessary to take your case to trial. I also thoroughly investigate all of the evidence to negotiate the best possible plea bargain or dismissal. In the past year, my process has resulted in the complete dismissal of Sexual Assault charges, complete dismissal of DUI charges, successful trial defense of felony domestic violence charges and many other outcomes that made my clients extremely happy. All cases begin with you, the client. I want to know what happened to you. 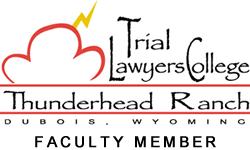 At Trial Lawyers College, we learn how to help you tell that story effectively and persuasively. We learn how to help you tell it and we learn how to tell it using other witnesses and evidence. The best Criminal Defense Lawyers tell a true story of innocence. We will find the evidence to do that together. If you want a Colorado Criminal Defense Lawyer that will listen, if you need one that will fight for you, call me now. The Constitution of the United States requires the government to follow the due process of law before depriving a person of their life, liberty, or property. Criminal statutes must therefore clearly define all crimes and criminal conduct, and cannot be vague or prevent understanding of conduct prohibited by law. Criminal statutes must define a guilty state of mind (called mens rea) as well as an illegal action (called actus reus). For example, it is not a crime to bump someone on a crowded train, because there was no criminal intent. It is also not a crime to think about harming someone without acting. This requirement also applies to attempted crimes. Conviction requires the defendant to take action to attempt a crime. An experience criminal defense attorney can explain these terms and concepts, and help you to understand the specifics of your situation. Contact a Colorado criminal defense attorney for issues regarding with your misdemeanor or felony. We represent clients in Boulder, Colorado and surrounding area. The Savela Law Firm, P.C. Give us a call at (720) 260-7392 or complete our inquiry form.